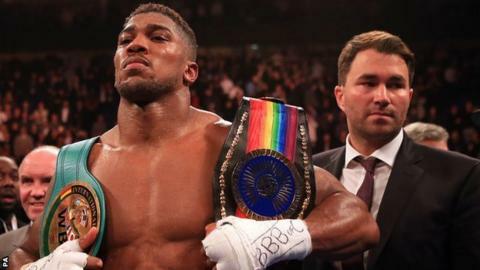 New British heavyweight champion Anthony Joshua says he would prefer to fight Dereck Chisora next rather than David Haye or Tyson Fury - former and current world champions respectively. Joshua won his title with a seventh-round knockout of Dillian Whyte, and has a perfect record after 15 fights. "Why not?" said the 26-year-old when asked about meeting Chisora next. "I need to be fighting people who are hungry and good enough but who I still have a good capability of beating." Chisora, 31, is a former world title challenger who lost a unanimous decision to Vitali Klitschko in February 2012 as well as suffering defeats by Fury and Haye. He appeared on the undercard of Joshua's win over Whyte on Saturday, coasting to a third-round win over Croatia's Jakov Gospic. "I could fight Haye, people want me to fight Fury, but you can't just come into professional boxing, show a little talent and be thrown in the deep end," continued Joshua in an interview with Sky Sports. "I don't need do-or-die type fights yet. "I need to build myself so that when I get to the top I have been in deep waters, done 12 rounds, been hurt and come back. That is how people become champions." Haye, who will return to the ring for the first time in three and a half years when he faces Mark de Mori in January, says that he would like to fight Joshua next summer. "I think Chisora's a good opponent next for Anthony and then me and him in a big fight in the summer," he told BBC Radio 5 live. "It just down to [promoter] Eddie Hearn and Joshua's people if they are ready for that challenge." Joshua, who won Olympic gold at London 2012, also said he would also entertain the possibility of a rematch with Whyte despite a rancorous build-up that spilled over into the fight with the pair twice having to be separated after the bell. "Kevin Johnson and Denis Bakhtov were supposed to give me rounds, but it was Whyte who actually did it, so why not use him again?" he added. "I learned more against Whyte than I did in all 14 of my previous fights. I enjoyed it - it was a good fight."